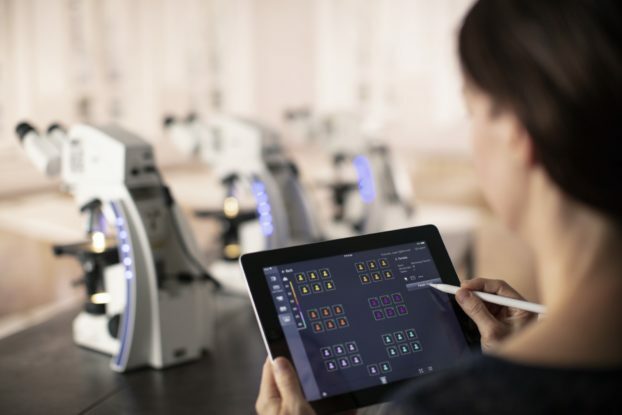 It expands the existing ZEISS Labscope installation and puts the lecturer in charge of all connected microscopes in the network of the digital classroom while they move freely around the classroom. It lets the teacher define working groups, send group-specific tasks, and share digital information such as documents or presentations, thereby fostering teamwork. The master device makes it easy to keep everybody on track. The lecturer only needs to define the classroom layout once. Simple reloading to start the lesson saves valuable teaching time. ZEISS Labscope Teacher helps teachers to actively organize their lessons and manage the digital classroom efficiently.